I received compensation for the links in this post. All opinions are mine alone. Graduation gifts don’t have to be complicated. In fact, the one thing every high school graduate or future college student needs is a gift card. 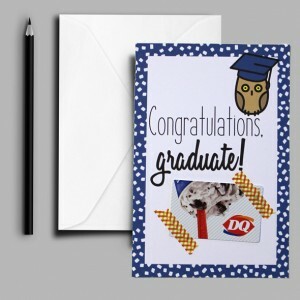 Personalize it with this free printable graduation gift card holder. It’s been longer than I’d like to admit since I was a college student. I’m sure a lot has changed since those days, but I’m pretty sure there is one thing that will always be the same. College kids need money and they’re mostly going to spend it on food. One of the best gifts you can give a high school grad – whether they have plans for college or not – is a gift card. Depending on where they’re going and what they’re doing, it might be helpful to find something pretty generic. Popular all-in-one retail giants like Walmart and Amazon.com are always good. Restaurants are nice too. The microwaved ramen diet may be popular, but a semi-healthy meal at somewhere outside the dorm or house will be appreciated. If you feel like a gift card alone isn’t very personal, it’s easy to pretty it up with a card. Add a personal message at the bottom and you’ll be the graduation gift hero. This card is simple but sweet. It has the message “Congratulations, graduate!” and a smart little owl. There’s space at the bottom to attach a gift card and sign it. Print your card on regular 8-1/2″x11″ cardstock and then trim it. I printed it at 100% for a 6-inch by 9-inch card, but you could scale it a bit smaller if you prefer. Attach a gift card in the blank space. I used washi tape because it holds really nicely but won’t tear the card when you remove it. Also, it’s super cute. Another option is to order a personalized gift card holder. They come in a variety of shapes and sizes, and some have space to hold more than one gift card.